Italy's Lorenzo Gagli beat Sweden's Jens Fahrbring at the third hole of a sudden-death play-off at Nairobi today to win the Kenya Open. They finished a shot ahead of three players. Duncan Stewart (Grantown on Spey) and Grant Forrest (Craigielaw) shared the honour of being the leading Scot They both finished on eight-under-par 276. Lorenzo Gagli secured his first victory on the European Challenge Tour by holding his nerve to beat Jens Fahrbring in a three-hole play-off to claim the Barclays Kenya Open title. They had tied after 72 holes on 11-under-par 273. Fahrbring came closest to winning on their first attempt at the par three 13th, with a birdie putt from ten feet just coming up short – both men went on to make par. “It was really good to play with Nico Geyger (he finished joint third) today as we are really good friends and we stayed patient but still very focused and I just played really, really well. 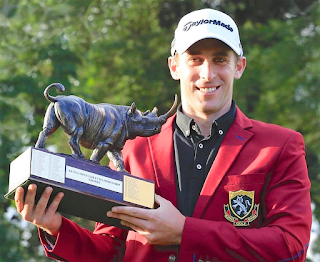 With this victory in Kenya Gagli jumps straight to the top of the Challenge Tour Rankings with 80,000 pts, while Fahrbring sits in second place with 55,000 pts. 273 L Gagli (Ita) 68 68 69 68, J Fahrbring (Swe) 72 70 64 67 (Gagli won sudden-death play-off at third extra hole).